AUSTIN, Texas (AP) — Larry Foyt's memories of the Austin area mostly involve water skiing and packs of adolescent boys sneaking a peek at the nudist beach in an area called Hippie Hollow. 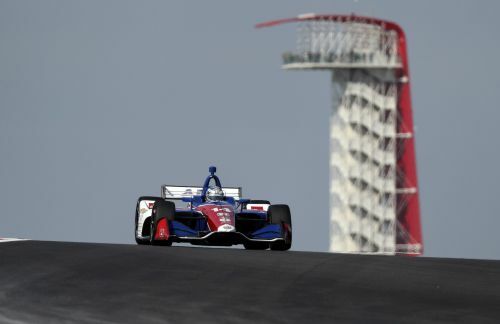 Being back in Central Texas makes the newest stop on the IndyCar circuit a "home race" for the Foyt family, just a couple of hours from their home base near Houston. Larry's brother went to the University of Texas and the family spent all summer on nearby Lake Travis when Larry was growing up. "Mom always loved the lake," Larry Foyt said. "We'd spend all summer there jet skiing, knee boarding, all the good stuff." That included IndyCar great A.J. Foyt taking his turns on the skis and sometimes taking someone's money. The story goes that A.J. Foyt would pretend he couldn't ski and make a bet he could be a quick learner. After a few falls, he'd be out of the water and slaloming on one ski. "Always competitive," Larry Foyt said. And then there was Hippie Hollow, the "clothes optional" area of the lake that would draw more than a few giggles from Larry and his friends. And it wasn't just the kids. A.J. made a point of driving his guests over on the boat to get a look and a laugh. "It was 'C'mon, you gotta see this,'" Larry Foyt said. "I remember being a little kid and my brother messing with, pretending they were going to throw me overboard at Hippie Hollow. I was little and was like 'No!'" Larry Foyt's first visit to the Circuit of the Americas was in 2012 for the track's first Formula One U.S. Grand Prix. He has been waiting for IndyCar to drive here ever since. "When you saw what they were doing, and doing it first class, immediately for me it was 'When is IndyCar coming here?'" he said. "We're the premiere open wheel series in the United States and we need to be here.'" Leist was 13th in Friday's morning practice, well off the pace of session leader Josef Newgarden. Kanaan was 21st. A top 10 finish Sunday will be the goal, Larry Foyt said. "This type of track has been kind of our Achilles heel the last year or two," Larry Foyt said. "We just need to start building momentum going into Indy. We still have a lot of focus on Indianapolis and feel we have a shot to win it." Despite being close to home, A.J. Foyt won't be at this week's race after attending the season-opener two weeks ago in St. Petersburg, Florida, and NASCAR's Daytona 500 last month. The 84-year-old four-time Indianapolis 500 winner had back surgery in July and then a staph infection, but Larry Foyt said he's not at the race this week because he's trying to get some property ready to sell. "It's always good when he's at a race," Leist said. "It was nice to have him around getting tips from him about the car. It was a great time." With A.J. Foyt's history of tractor accidents and encounters with bees — a 2005 bee attack left him with more than 200 stingers in his head — Larry Foyt can't help but wonder what message will be on the other end if the phone rings from back home. "At this point, he's lived through it all," Larry Foyt said. "You wait for the story. It's bound to be good."